Chips and dip? Check. Big screen TV? Check. A Super Bowl party that gives back? Of course! 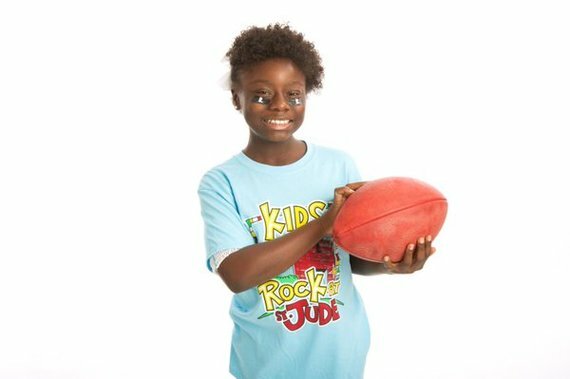 This February 7, while the country watches the 50th Anniversary of the National Football League's biggest day, you have the opportunity to make a difference in the lives of children fighting some of the most devastating illnesses by hosting a St. Jude Game. Day. Give Back. party for St. Jude Children's Research Hospital. St. Jude patient Kayla, reading to play some football! By joining the brothers of Omega Psi Phi National Fraternity, you can turn your tailgate or Super Bowl watch party into a party with a purpose during the big game, because no matter which team you are rooting for to take home the Lombardi Trophy, we can all root for a cure. Founded at Howard University in 1911, and the first predominantly African-American fraternity to be founded at a historically black university, Omega Psi Phi is proud to be the National Volunteer partner for St. Jude Game Day. Give. Back. The mission of St. Jude Children's Research Hospital is to advance cures, and means of prevention, for pediatric catastrophic diseases through research and treatment. Consistent with the vision of our founder Danny Thomas, no child is denied treatment based on race, religion or a family's ability to pay. Treatments invented at St. Jude have helped push the overall childhood cancer survival rate from 20% to more than 80% since it opened more than 50 years ago. In addition, St. Jude has one of the largest pediatric sickle cell programs in the country. They treat children with sickle cell disease from birth through age 18. Sickle cell disease is the most common inherited blood disorder in the United States, affecting about 100,000 Americans. It can occur in all races but is most common in African-Americans and Hispanics. About one out of 500 African-American babies born in the US has sickle cell disease. Setting up your Game. Day. Give Back. party is simple. First, visit St. Jude Game. Day. Give. Back to sign up to host a party. Then, set up your fundraising page in just a few steps. Finally, simply invite your family and friends to your in person or virtual Super Bowl watch party, and let the fundraising and football playing begin! St. Jude will be rewarding the top fundraising Game Day parties some tailgate friendly prizes, like coolers and bluetooth speakers. What a great way to enjoy the world's biggest game, and at the same time make an amazing difference in the lives of families battling childhood cancer and sickle cell anemia. So make your game day worthy of the most epic of end zone dances, and sign up to host a Game. Day. Give. Back party!